Today is December 7. A day which for 21 years has been especially meaningful to me because it is the day my son was born. On December 9 he will be leaving for boot camp in San Diego, California. This man-child of mine has not made being a mother easy. I’ve over protected him since the death of his father when he was only seven. 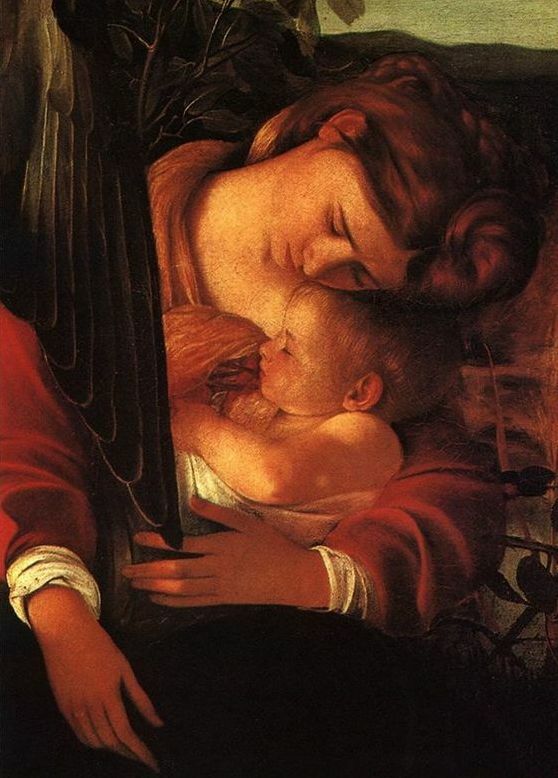 I’ve cradled him as tightly to my breast as Mary does her child in this painting above. And, in two days he will be leaving my care, as he should. Did I know what I was getting into at the altar when I said, “I do”? Did I know what I was getting into when I received my degrees in education, a job so different in 1984 than what it is today? Did I know what I was getting into when I became pregnant, never fully anticipating the inevitable break my child would make into adulthood? We can’t see our lives any farther than today. That’s probably a good thing; we are given grace sufficient for the day. (2 Corinthians 12: 9) We are not promised a life of joy, or a life of ease, or a life of peace. Like Mary, we take rest on our flight when we can get it, knowing that we are given His grace. May they give you all the comfort and peace you need this Christmas. Happy birthday to your son! And a *hug* for you because I know how hard it is letting go. Thinking of you today. (And it's my oldest niece's birthday today, too … so I know that it's a very good day for offspring (even if they're one's offspring once removed, in my case). And may you be comforted with the peace of God's loving protection. It's been 14 years since my only son left home at the age of 18. I knew when he left that he would never live with me again. There were some very hard days, but we all survived. I've certainly never forgotten the feeling. Oh dear, this was supposed to be a post about how the angel wings cover us all and now I'm afraid it's all about me! While I am soaking up everyone's comforting, please know that I also wanted to express how I feel we are all covered by His grace. Good luck to you and your son on this transition. Happy birthday to your son. Letting go is hard, but that is, after all, what we raise them for. Hugs to you. I don't know if you ever read any of Isobel Kuhn's books. She and her husband were missionaries in China. She spoke of the “feather curtain of God” in speaking of His protection. I would claim that for your son. I know he probably has no idea what he is in for. Praying for both of you. Sorry, I didn't mean to highjack your commnet section. Happy birthday to your son, and good luck to both of you as he begins his new adventure. My heart breaks for your pain and anxiety Bellezza, but I know good and well that you're a woman of faith and no matter how hard it is, you will endure. Thank you. I just knew you would have an awesome post for the tour. God bless you and keep you and your son safe. What a lovely post. It's so hard when they leave home (my eldest is 24 now), and on top of that, going into the army – so much pride, and so much anxiety, there. May he be safe, though as your post so lovingly explains, there are no guarantees, only taking our life as it comes and having hope and faith. Truly a lovely thought for this season. May you feel love and grace around you as your son makes his way in the world,knowing you did the best job you could while he was in your care. Happy birthday to your son, and happy memories of giving birth day to you. My heart goes out to you because I know just what you're going through. It is SO hard to let them go, and you have to let him go to a difficult job and a potentially dangerous one. However, you know he's going to be trained brilliantly, and if he's a bit like you, he'll be full of bravery and light. Thinking of you today… and sending a virtual hug. Your post brought tears to my eyes. My son just turned five on December 4. Thank you for your lovely reminder that God is watching over us and our precious children, whether they are in our arms or far away from us. All the best to your son, and to you. I trust mother and son, despite being in different places, are united in spirit and in love this beautiful Season. Christmas is the best reminder that Someone had given His only Son for us a long time ago, and is ever present in space and time for us. You're in my thoughts, Bellezza. Peace to you. And your son.